Prior to installing a new sump pump in your home, you might have some questions about what they are and how they work. We think that’s fair enough, as there are many misconceptions in regard to when sump pumps are needed, what their purpose is, and whether or not they’re even a good thing to have installed. We’re here to help clear up the confusion and help you make the best decision when it comes to waterproofing your basement and protecting it from flooding. Sump pumps, put simply, are pumps installed in the lowest part of your basement or crawl space that work to remove water that has accumulated in its sump basin, or pit. This pit is excavated during construction, and because it is located at a low point, water flows to the pit through drains or soil. Once water has filled the sump basin, it is pumped out and away from your home’s basement. Do I Need a Sump Pump for My Home? Now that you understand how a sump pump works and what its purpose is, you might be wondering whether your home is in need of one. It is true that sump pumps can prevent flooding and direct excess moisture away from your home and your basement. However, not every home will need a sump pump. Whether or not your home needs a sump pump primarily depends on your location. The more prone your location is to flooding and the effects of heavy rain, the more likely your home should have a sump pump. Your home is located in a lower lying area, like at the bottom of a slope or hill. Your basement is prone to flooding or has flooded before. You live in an area that experiences large amounts of rain and snowfall. You store valuables in your basement that could be destroyed by water or mold. I’m Buying a New Home With a Sump Pump Installed, but is a Sump Pump a Bad Sign? If you’re buying a brand new home and noticed that the previous owners had a sump pump installed, you might be wondering if it’s a warning. Previously installed sump pumps aren’t a bad sign at all. No matter where your home is built, it will going to be subject to regional weather. A previously installed sump pump is simply a sign that the owner before you took proactive steps in preventing water damage from harming their foundation and possessions. What if I’m Already Struggling with Water in My Basement? Sump pumps aren’t just a proactive approach. If you’re already struggling with water in your basement, sump pumps can be an effective solution for removing water. Because sump pumps are interior drainage systems, they don’t require the same amount of disruptive excavation and landscaping damage as other exterior methods. A sump pump can effectively collect and channel water out of your home. What Sets our Sump Pumps Apart? Our full line of Pro Series primary sump pumps is built to run continuously 24 hours a day, seven days a week, 365 days a year. They are a commercial grade pump that is only sold to and installed by qualified contractors. These pumps are backed by 1½ year, 3 year and 5-year warranties when the pumps are used in intermittent applications. A one year warranty is available when used in continuous duty application such as fountains or ponds. The new PHCC Pro Series, “Pair of Pumps” combination systems, couples an energy efficient primary sump pump and battery backup sump pump into one compact system. The primary pump operates off AC power. If the power is interrupted, or more water is coming into the sump than the AC pump can handle, the backup sump pump will begin pumping automatically. The units come pre-assembled for easy installation and include four float switches for ultimate protection. Two floats with the primary pump, and two floats with the backup. The combination systems also contain unique monitoring features that warn the homeowner if the power goes out, battery fluid is low, the backup pump was activated, or if the battery is discharged, defective, or battery terminals need cleaning. In addition, the PS-C33 pump controller can send an alarm signal to a home security system or auto dialer. The Bell sump pump basin is the most efficient, safe and innovative sump design available. 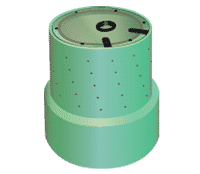 The Bell sump basin is molded from high strength, impact resistant polyethylene to provide years of service in collecting water from around foundations. The unique bell shape, of the Bell Sump Basin, not only makes sump pump systems more efficient but also increases the life of basement drainage systems. Still have unanswered questions about sump pump installation? Each of the questions below have been answered by our foundation repair professionals to help you find the best waterproofing solution for your basement or crawl space. Do you suggest upgrading sump pumps? Certainly. Sump pumps do have a limited life, typically in the range of 5 years. Many people have units in their home as old as their home, which can be decades old. You do not want to trust your home’s water protection system to a cheap, old unit. There have been advances in technology, reliability, and overall power since sump pumps started to be put into homes. Do your sump pumps come with a warranty? Yes! All of the sump pumps we install come with a manufacturer’s warranty. Do you have sump pump units that have a battery backup? Yes. Check with your evaluator to review the bid specifications, but nearly all of the units we install come with a battery backup. We suggest this, as electrical power outages are common in times when there is a lot of rain. The time you most need your sump pump to be working! I have an older home that does not have a sump pump. Should I have one? Most likely yes. Sump pumps are now part of the code for new homes, and we believe there is a good reason for this. Are there any new technology advances? There are. Our manufacturer has recently released a WiFi unit, which allows you to monitor the pump’s performance and get notifications to your telephone if here is a problem. This is a great system to ensure your system is properly maintained and ready to function. Is there a difference between the water pumps you install and the ones available at the local big box home improvement store? There absolutely is. We install the “Pro Series” sump pumps from PHCC. These units are only available from certified, professional installers and provide a level of durability, power, and reliability that you simply do not get from a retail pump. Is there an advantage to having a backup pump / battery backup other than power outages? Yes there are. We install dual pump systems that will trigger the backup system to work if the water flow is greater than the primary unit can handle. In this case, when the backup system kicks in, you will have two units working to keep up with the water that needs to be moved away from your home. My sump pump seems to run constantly. Is this normal? Not really. We suggest you have us come out to look at the unit. There may be some simple repairs to get your existing system to work. Or the fact that it runs all the time could be a sign that you need to consider upgrading or replacing your existing unit. A properly functioning sump pump is so critical. Do not wait to find out you have a problem until you have a basement full of water!